As you know, I am happily carving out my little space in the world of Children’s Literature… one book, one message at a time. To do this, I’ve begun partnering with well-respected, family-owned businesses from different parts of our country. From Tony Packo’s in Toledo, Ohio… to Campbell’s Sweets Factory in Cleveland, Ohio… to The Popcorn Cellar in Naples, Florida… and Smok’n Pig BBQ in Georgia… I’ve had a world of fun. You can purchase our book Murdick’s Mackinaw Mystery online at Amazon.com. Thanks for visiting! Be sure to LIKE us on Facebook! 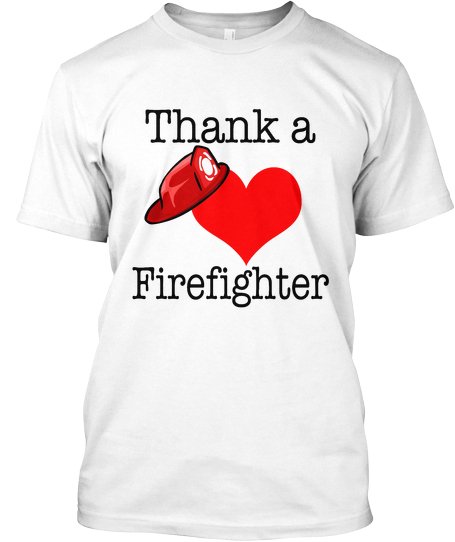 Buy THIS Shirt, Fund My Fire Safety Children’s Book! Today, the United States of America turns 237 years old. We’ve made it this far because of people like you and I. This country is built on a quilt of dreams and goals, sewn together by innovators and groundbreakers. We are also able to celebrate today because of people willing to serve this country: members of the military, teachers, police officers, firefighters and those politicians that still have servants’ hearts. Without these members of our community, that quilt of dreams wouldn’t have been protected, enabled and nourished. It does, in fact, take a village… and we all do our part every single day. Independence Day, to me, is about celebrating each and every one of us— and the talents we bring to the table, which allow this country to thrive. Recently, a firefighter in the hometown of co-author Joe Kelley was killed doing his job. The outpouring of support from the community has been overwhelming. Then, just this week, 19 firefighters were lost battling a giant wildfire in Prescott, Arizona. In fact, 2500 people every year lose their lives to house fires… and this isn’t including the public servants that fight them. Parents from across the country have written to us, giving us ideas for future books on a variety of subjects. But no topic is mentioned as often as fire safety. We’ve got a really cute, very educational story written. Now we just need funding to complete the illustration process. If this book is completed, we will offer it AT COST to fire departments across the country, so that they may use it for fundraising or awareness campaigns. Please consider making a purchase. Wear your shirt proud. And, if you could take a moment to share our campaign with your friends or even your local fire department, it would mean the world to me. Oh, alright. I couldn’t really watch this video all day, but I wanted to share this with you. Joe and I appeared last week on television to promote our books. This is rare— usually it’s just me, because Joe gets too nervous.